I borrowed this Quickie Giveaway idea from J. Kaye's Book Blog where I recently won a book. Thanks J. Kaye! One of winners selected by Random.org won a copy on another blog so the first person to tweet this message to @monie_g wins a copy of The Girl Who Stopped Swimming by Joshilyn Jackson. 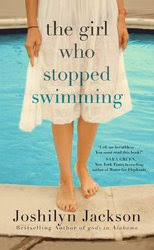 @monie_g I want to win The Girl Who Stopped Swimming by Joshilyn Jackson. The only rule for this contest is that you have to live in the US or Canada with a street address, not a P.O. Box. While Laurel's life seems neatly on track-- a passionate marriage, a treasured daughter, a lovely suburban home-- everything she holds dear is threatened the night she is visited by the ghost of her 13-year-old neighbor Molly. The ghost leads Laurel to the real Molly, floating lifelessly in the Hawthorne's backyard pool. Molly's death is an unseemly mystery that no one in her whitewashed neighborhood is up to solving. Laurel enlists Thalia's help, even though she knows it comes with a high price tag.